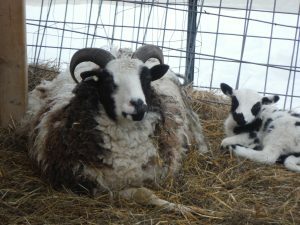 We began the baby season earlier than usual this year, and we are still waiting on a few mothers to deliver as I write. 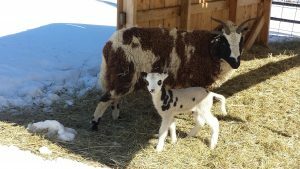 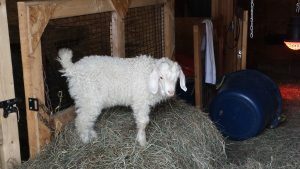 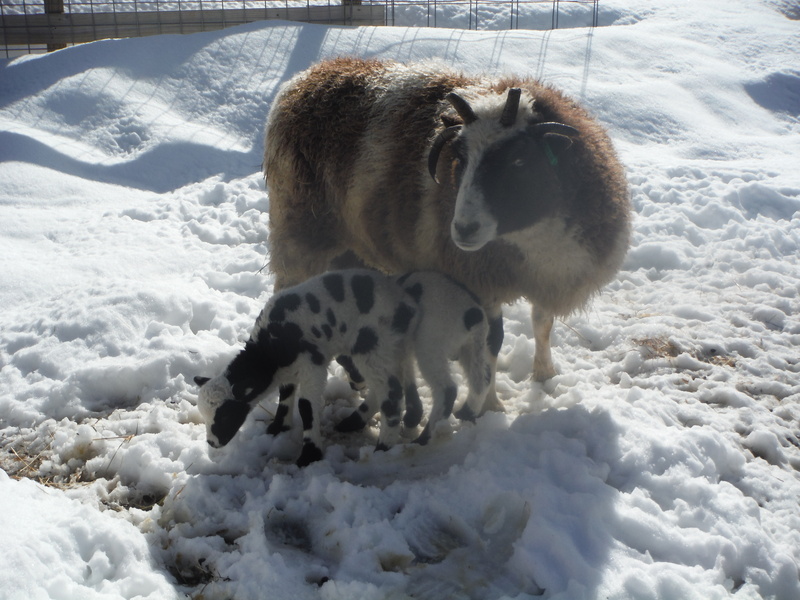 Our angora goats were sired by three different bucks this year: CHF Sebastian, our senior herdsire, HOME TJ, a new soft brown buck in the R/B/B pool, and our own CWF Seamus, a reverse badger son of CWF Bonnie and CHF Sebastian. 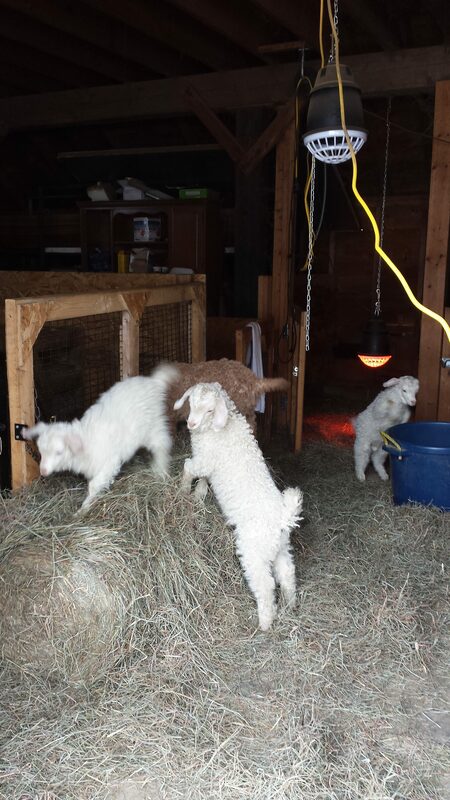 We had several AAGBA white does bred this year, with some lovely color carrying offspring as a result. 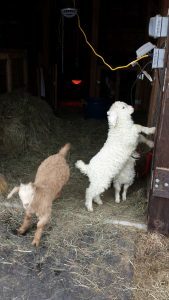 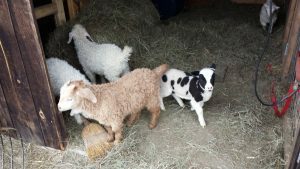 These babies should produce gorgeous color when bred back to colored angora goats, and bring the fine soft fiber of the AAGBA genetics to their offspring. I think we are keeping one buck and one doe, but still have a few available for sale. 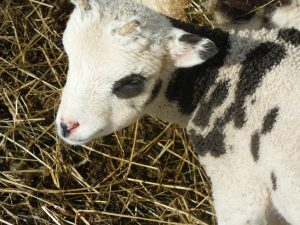 I only have one doeling available at the moment, who could go with her twin brother (wethered) as a companion. I also have one or two bucklings available. Our Jacob sheep have also been presenting us with some lovely lambs. Some were sired by Catawampus Zedd, a 2 horned lilac carrier, and the rest were sired by Armstrong’s Oak. 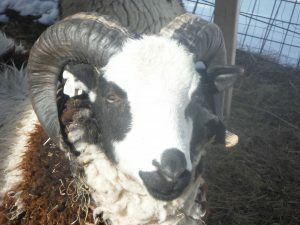 Oak is our new herdsire and he is lovely, with a kind temperament. 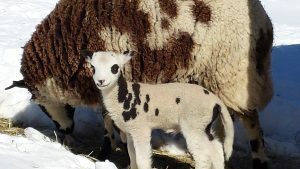 He won a large ram lamb class in the 2016 Jacob Sheep Show at the Garden State Sheep Breeders Festival. 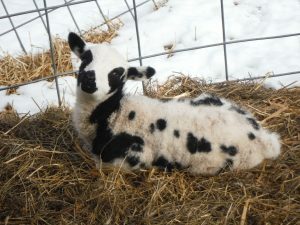 We picked him up in NY on the way home from Rhinebeck and he went straight to work! 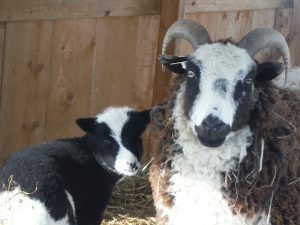 We have a nice crop of ewe lambs this year, as well as some handsome ram lambs. 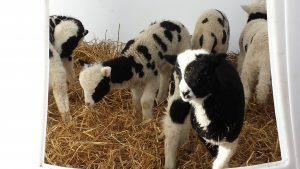 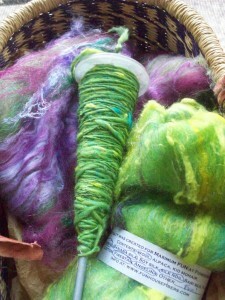 They all should have lovely fleece. 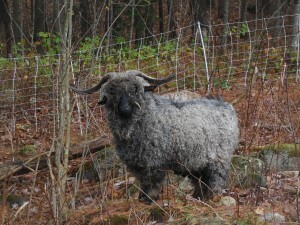 CWF Gandalf. 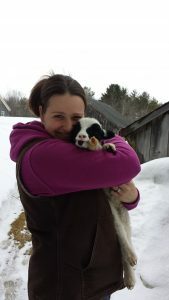 This guy is a keeper. 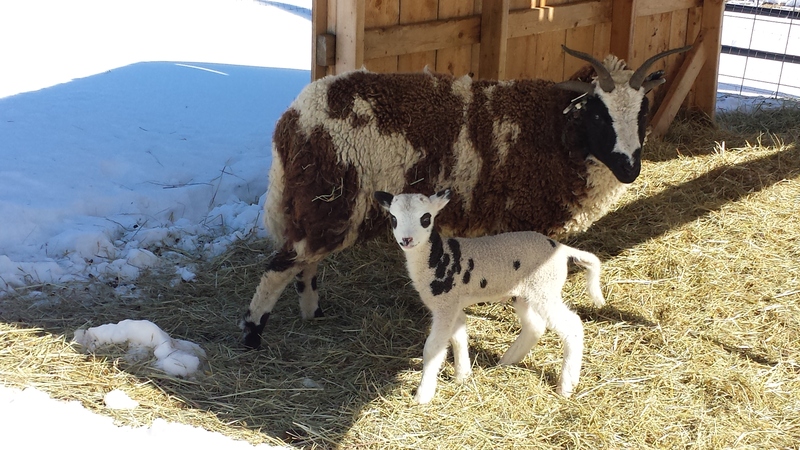 He combines all our breeding choices over several generations in our spectacular buckling. He is white, but carries color and pattern. 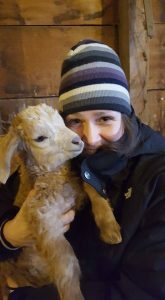 Luna, a jacob lamb, ia a bottle baby and has been hanging out with the goats in their barn. Gracie leaping into a bucket, while the boys destroy a hay bale! 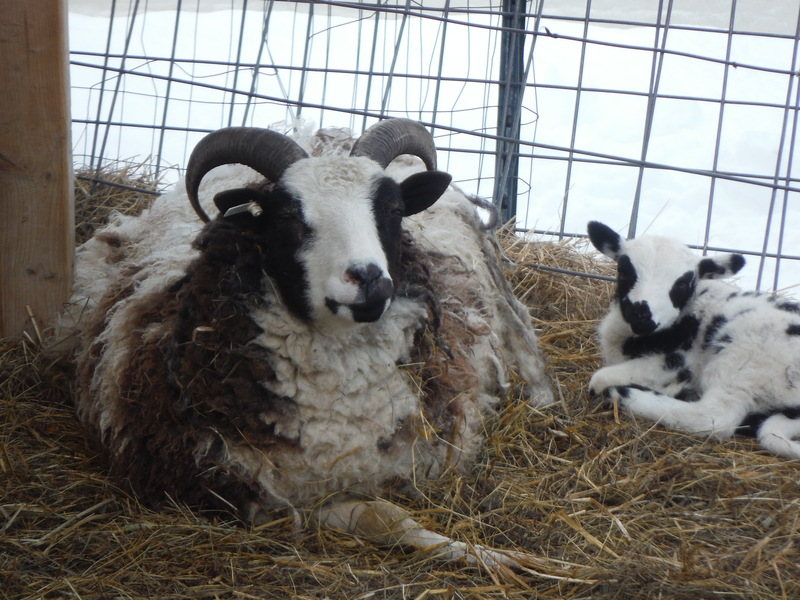 Wallis Fine Jenny with her ram and ewe lamb by Armstrong Oak. 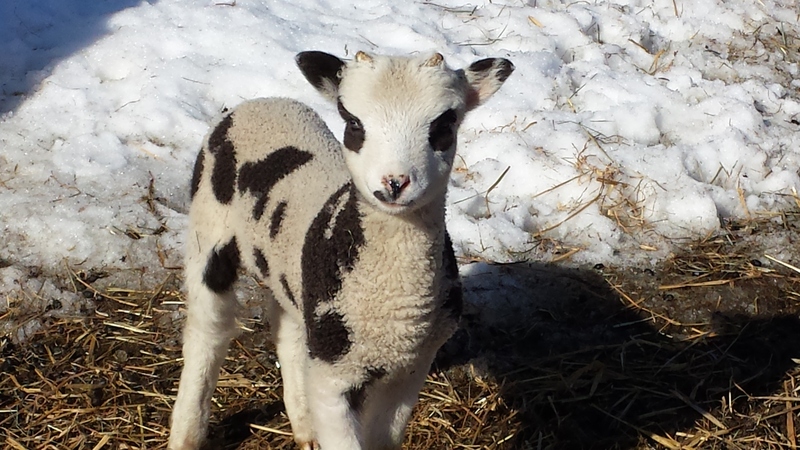 I am very pleased with our lambs and kids this year. Please contact us if you are looking to add to your breeding program, or start a new flock!